MonoCarbon is a 2-ply, True non-dyed carbon film customized with advanced Nano-technology. Carbon is a stable particle that gives long-lasting durability in a rich, black shade. Don’t settle for subpar and “fake carbon” films and regret it down the road. Includes a 5 year nation wide warranty. and a lifetime local warranty from Royal Tinting to never peel, bubble or change color. 2 dr coupe price listed, call or use contact us form for vehicle specific pricing. The Phantom s5 Nano Carbon Ceramic window film uses innovative non-conductive patented Nano-Ceramic technology to equip your car with all the advantages of both carbon and ceramic films, providing 55-72% IR heat rejection and 99.9% UV rejection. Includes a lifetime nationwide warranty to never peel, bubble or change color or fade. The Phantom s7 Nano Carbon Ceramic window film uses innovative non-conductive patented Nano-Ceramic technology to equip your car with all the advantages of both carbon and ceramic films, providing 70-81% IR heat rejection and 99.9% UV rejection. Includes a lifetime nationwide warranty to never peel, bubble or change color or fade. Also includes our “No Fault” warranty at no additional cost. Feel the immediate difference of Phantom s9 premium Nano-Carbon Ceramic window film uses innovative non-conductive Nano-Carbon ceramic technology to equip your car with all the advantages of both carbon and ceramic films. 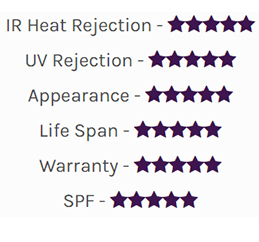 This film delivers the luxury that you deserve with nearly 100% UV and IR heat rejection providing the highest heat rejection of any automotive window film on the market today. Includes a lifetime warranty to never peel, bubble or change color or fade for the life of the vehicle. Also includes our “No Fault” warranty at no additional cost. Keep things light with Platinum Air 7090 – The perfect finishing touch to 91% IR heat rejection! Available in a subtle blue shade, this Nano-Ceramic film was expertly designed for all applications. Block the Heat, not the light.